This is an unofficial multi-platform update of Spelunky. It can be compiled for both Windows and Mac OS X without editing the game's source code. Every effort has been made to preserve the gameplay of Spelunky in it's original form. However, some changes have been made to the source code to fix bugs or optimize for ease of use and development. This update was created by idyll with assistance from the Spelunky community. 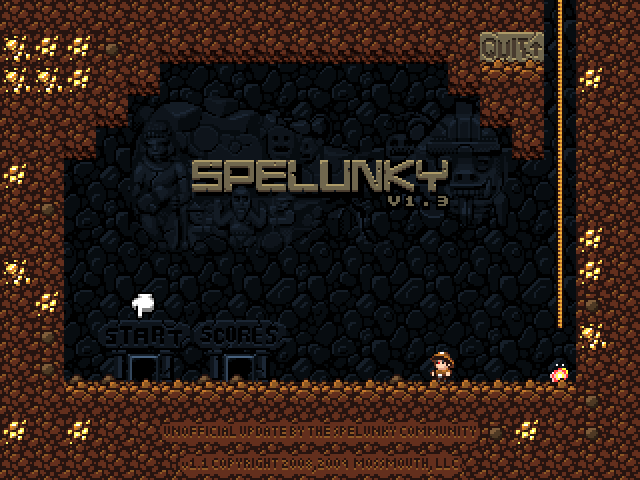 Spelunky is copyright Derek Yu and Mossmouth, LLC. Feel free to make mirrors of these links as I don't know how long they will last. - Replaced Super Sound System with Caster extension for cross-platform playback of audio files. - Renamed "Resolution:" subtitle in Config to "Scale:"
- Changed location of config files and "levels" folder to "~/Library/Preferences/Spelunky"
- Moved "sound" folder to "Spelunky.app/Contents/Resources"
- Fixed "Enter" key not registering in "Level Editor" and "Load Level"
(1) Game Maker for Mac is a port of the Windows version of Game Maker 7. Converting the Spelunky source code from Game Maker 8 to Game Maker 7 format was necessary to make this game run on Mac. I was unable to get Spelunky to run in Game Maker Studio and I didn't want to restrict source code changes to a newer version of Game Maker that most people don't yet own. If you make any edits to the source, please do so within Game Maker 7, Game Maker for Mac or LateralGM so that Mac users can make use of any changes you implement. Converting from Game Maker 8 to Game Maker 7 format with LateralGM requires setting the transparency by hand for all the sprites and backgrounds that need it. This was a real pain! (2) These keys should be re-enabled in "Global Game Settings" when compiling the code as a Windows executable. Besides Mac using the function keys for other behaviors by default, using F4 to switch between windowed mode and fullscreen causes graphic corruption. This seems to be an issue with Game Maker for Mac. F9 is unneeded since Mac has several built-in keyboard shortcuts to save screenshots to the Desktop in various file formats. (3) Unlike the original default of "X3" screen scale, "X2" worked fine in fullscreen mode with every resolution I tried. (4) The "Flare" key/button would have functioned like the "Bomb" and "Rope" keys/buttons, but it was not used in the final 1.1 version of the game. However, there were still references to it in the source code. Config and Spelunky would assign a default value to the "Flare" key/button and check for it's value in the config files. Config also wrote the default value it assigned to the "keys.cfg" and "gamepad.cfg" files. All references to the "Flare" key/button have been commented out or deleted. You should delete any old "keys.cfg" or "gamepad.cfg" files and reconfigure your keys/buttons in Config. (5) The Damsel, when dead and bounced on the ground, would make a sound, but not when alive. This behavior was the opposite of enemies you can carry, so I assumed it was a bug. Thanks to TyrOvC for helping me fix this issue. (6) The original softfullscreen code doesn't work on Mac. Window borders, window icons and the Menu bar can't be hidden by Game Maker for Mac. This is now taken into account when calculating the scale of "Fit screen" while in a window. Turn hiding on for the Mac "Dashboard" and you'll have the largest play area possible in windowed mode. (7) Mac treats function keys differently than Windows. Many of them are assigned a particular behavior by default. These behaviors take priority when Spelunky is running in a window. Asking the player to disable the function keys or modifying system config files while Spelunky is running seemed like a bad idea. Instead, when playing Spelunky in windowed mode, the player must hold down the "Alt" key before using a function key. The function keys still work without the "Alt" key when Spelunky is fullscreen. (8) The GMac-Terminal extension is used in Config to execute Spelunky when the "Start game on exit" box is checked. This extension allows access to Mac "Terminal" commands. Allowing Config access to the "Terminal" is potentially dangerous, but I've experienced no ill effects from using this extension. Game Maker for Mac's built-in function to run external programs appears to be broken. "Fit screen" scale is not always pixel accurate in fullscreen mode and some pixels on screen may appear double their actual width. "X2" scale in fullscreen mode is now the default because it should behave as intended for most resolutions. Sometimes, when using the "Level Editor" in fullscreen, your mouse cursor can't move past an invisible wall on the bottom right side of the screen. This is caused by using a scale that's too small for your display resolution. Try a bigger scale like "X4" or "Fit screen." Rapidly entering and exiting water can cause bats to fly instead of hanging. Occasionally, vines don't disappear and lamps don't drop after the block above them is destroyed. Gamepads don't work with the Mac version of Spelunky because of a limitation in Game Maker for Mac. It appears that YoYo Games is aware of the issue, but is unwilling or unable to fix it. This issue still exists in the latest version of Game Maker Studio as of this writing. I find Spelunky much easier to control with a gamepad. I recommend using an app such as ControllerMate to translate your gamepad button presses into keystrokes. The "Fit screen" scale behaves strangely in fullscreen mode. I tried this setting with two different Macs each with a widescreen monitor. With the first Mac the play area was shifted all the way to the left and had a large black bar on the right side of the screen. Normal behavior is two black bars on either side of the play area. The second Mac stretched the play area to fill up the entire screen. I didn't see this behavior with these settings in the Windows version of Spelunky. I assume this is a problem with Game Maker for Mac. The "period" key acts like the "Delete" key in the "Level Editor" and "Load Level" screens. Do you really need periods in your custom level names? 1. When I open the source code in Game Maker it produces an error that says: "Cannot find extension package: Caster" and/or "GMac-Terminal." Why? This new version of Spelunky requires the Caster extension for audio support in both Windows and Mac. The GMac-Terminal extension is also required if you are compiling Config for Windows or Mac. Game Maker for Windows does not actually use the GMac-Terminal extension, but it must be installed. These extensions are provided with the Spelunky source code for your convenience. You can find them in the "Extensions" directory. 2. Why do I get an error about "OpenAL32.dll" when I try to run Spelunky and/or Config? The Caster extension requires certain "dll" files to function within Windows. These "dll" files are located in the "CasterDlls.zip" file in the "Extensions\Caster" folder. Extract its contents to the same directory as the "gmk" files to fix this error. 3. Why is there no sound when I run the Spelunky source code from within Game Maker? Did you install the required Caster extension? See the answer to question one above. 4. Why do I get an error about "Unknown function or script: run_terminal" when I run the Config source code from within Game Maker? Did you install the required GMac-Terminal extension? See the answer to question one above. 5. What is the "LastCompileStep.command" file in the "MacOSX" directory? Double click the "command" file in "Finder" and it should run. The script will delete unneeded files and copy the sound and icon files into the apps. It will also delete the Game Maker runner in "Config.app" and create a relative symbolic link to the runner in "Spelunky.app." This means that Config must be executed from the same directory as Spelunky or it will not run. The benefit of this is a savings of 17.7 megabytes. No point in increasing download times or wasting hard drive space, right? 6. Why don't F4 and F9 work any more? These keys are disabled by default because they cause problems when used on a Mac. You should re-enable these function keys in Game Maker under "Global Game Settings" when compiling the source code as a Windows executable. 7. Why doesn't the executable I created have the "Spelunky/Gold Idol" icon? Icon formats are not compatible across Windows and Mac. The icons for both Windows and Mac are located in the "Icons" directory. Point Game Maker for Windows at the "Windows.ico" file and Game Maker for Mac at the "MacOSX.icns" file. 8. Why is the source code in Game Maker 7 format? Game Maker 8.1 is better! While I agree that Game Maker 8.1 is faster and has less bugs, the Game Maker 8 and 8.1 file format isn't supported by Game Maker for Mac. Even though the source code is in Game Maker 7 format it must be compiled with Game Maker 8.1 or newer to run in Windows. See the question below for more information. 9. Why do I get an error about "Unknown variable os_type" when I try to run the source code with Game Maker 7 or 8? Unfortunately, Game Maker 7 for Windows can only be used to edit the source code and not test it. The code makes use of the "os_type" function to discover which operating system it is running on. This function was introduced in Game Maker 8.1 for Windows and Game Maker for Mac. Since Game Maker 7 and 8 don't support "os_type," both will display an error if you try to run the source code as is. If you wish to edit the source code and submit your changes to this project please do so by posting your code in a reply to this topic. Please document the line numbers and asset names of whatever you change, add or delete. I am trying to keep an accurate log of all the changes made. Feel free to use the source code as you see fit provided that such use doesn't violate the licenses listed in the "ReadMe.txt." so, let's consider that hypothetical situation where I have better things to do than read all this text, and that I didn't really find any game breaking bugs in spelunky and I would probably not remember anyway after all these years. No problem. I found Spelunky a few months ago. I love it. I have a Mac and wanted to play the latest version of Spelunky on it. This was not possible until now. This update does fix issues for Windows users, but I doubt they will notice a difference. That doesn't matter to me though. This update is mainly for my fellow Mac users. And all the Mac users will be pleased for your brave effort! Hurray! “Spelunky” is damaged and can’t be opened. You should eject the disk image. 9. Drag and drop the Spelunky app to the end of recently typed line.